Suppose we are interested in finding out how much energy was produced during mid-May, 2010, by the photovoltaic array on the garage at the solar house. The Report Generator on the GRIDc website takes out the guesswork and allows us to pull energy and power information for specific periods of time for the solar house, annex and garage. Choose Start Date and End Date: Let’s select a period of two weeks in mid-May, 2010. When you click inside the Start Date and End Date fields, a calendar will pop up, which will allow you to easily choose dates of interest. Otherwise, you can type in the dates manually. Let’s look at the period ranging from 5/9/10 to 5/23/10. 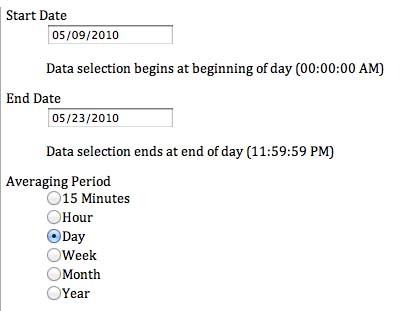 Choose Averaging Period: You can choose the averaging period by clicking the box next to the suitable option; you may only choose one. We are looking at a two-week period of time, so let’s try an averaging period of daily over the two weeks. QUESTION: Why do I select daily data if I want to know about energy production over two weeks? ANSWER: The data you obtain from energy meters are cumulative; therefore, in order to obtain the amount of energy consumed or produced in a given week, you will have to subtract the energy readings of the last day of the previous week from the final day of the current week. Also, you may be interested in seeing the variation of energy produced each day during the two-week period. If you want to know more about production or consumption trends at different times of the day, you might choose an averaging period of 15 minutes instead. Choose Data Source: Choose the appropriate data source by clicking the boxes that apply within each tab. You may choose more than one source (like PV Array Power AND PV Array Current) and you may choose cources from more than one tab (like House AND Garage). Let’s choose the Garage tab and then click the check box next to PV Energy Produced. Generate Report: Once You have chosen the date range, averaging period, and data source(s), you are ready to click on Generate Report. 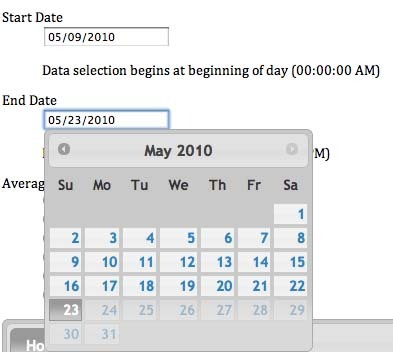 Note that the column on the left, “SampleTime,” lists the date range you chose (5/9/10-5/23/10), divided into the averaging period you chose (single days). The column on the right, “Garage PV Energy Produced” gives daily readings in units of kWh, or kilowatt hours. http://www.GRIDc.net  Units  Creating a Spreadsheet Graph.